When the expansive exhibition “Iran Modern” opened at New York’s Asia Society last September, more than one critic noted that it contained news that was bound to surprise many American art lovers: that Iran, of all places, has a vital modern art movement that has survived from the late 1940s till now and includes numerous artworks that look very impressive when set next to those of the West, whose curators and chroniclers too often still discuss modern art as if it were solely a product of their culture rather than a global phenomenon. 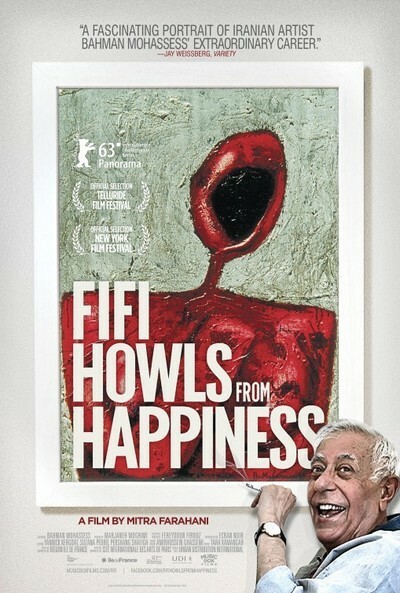 One of the artists prominently represented in that exhibition, Bahman Mohassess, is the subject of Iranian filmmaker Mitra Farahani’s fascinating documentary “Fifi Howls from Happiness,” which is as much a portrait of an extravagant personality as it is an account of his work. That work, though, is singularly significant, in part because the artist has joined some of his nominal enemies in trying to destroy as much of it as he can. Although filmgoers may not recognize his name, the film shows us early on that Mohassess paintings and sculptures regularly command prices in the hundreds of thousands of Euros at European art houses. When Farahani set out to make a film about Mohassess, she first had to find him and convince him to be interviewed, no easy task for an artist who had deliberately retreated from the world and shrouded himself in mystery. Though for roughly a half-century he had divided his time between Iran and Italy, by 2010, when the film was made, he was only residing in his second homeland. Farahani finds him in a hotel in Rome. Though prone to giving the filmmaker regular suggestions on how to do her work, he seems to have no hesitancy about being filmed. In fact, like other artists, he apparently regards his life as one of his creations, and may have decided that his performance for Farahani’s camera would rank among his final works. Nearing 80, with a terrible smoker’s rasp, he seems quite happy to talk on and on as long as he can cadge cigarettes. Yet his chipper demeanor and explosive laughter are not the marks of a man who’s reached a contemplative serenity toward the end of his life, but quite the opposite. Though he does it with a grin, Mohassess rages against the dying of the light as well as many of the things the world presented him with during his life. Born in the Caspian Sea town of Rasht, he was studying art in Tehran in 1953 when an American-backed coup overthrew Iran’s democratic government and reinstalled an autocratic monarch. The political and cultural repercussions of this event seem to have propelled his first move to Italy, and perhaps gave him an enduring cynicism regarding governments. Like many Iranian artists (including filmmakers) of his generation, he had works suppressed under the Shah’s regime (one commissioned statue of the royal family we see is quite daring) before the 1979 Revolution, and under the Islamic Republic after. The art works we are shown (mainly in reproductions) as Mohassess talks about his career are quite striking, evoking comparisons from Picasso and Matisse to Francis Bacon (the film’s title comes from a painting that hangs in his living room). Unlike other Iranian modern artists, he doesn’t use visual motifs from the Islamic and pre-Islamic past, and the political subjects he sometimes targets tend to be global—the My Lai Massacre, environmental disasters—rather than specifically Iranian. Roughly two-thirds of the way through the film, new characters are introduced: two wealthy Iranian brothers who live in Dubai and want to commission a major work by Mohassess. They come to visit and, where he had been expecting to find “stiff and stuffy” types, it turns out they’re “decent” guys whose company the old misanthrope obviously enjoys very much. Things remain on a genial level even when they haggle about money (they offer a 10K-Euro down payment on the 100K total; he demands 70K, saying it’s the way he’s always worked), and he allows that if for some reason he’s unable to complete the work, they can take what they’re owed from the work left in his possession at his death. It’s a prescient provision. Death is not far away when Farahani begins her film and she’s still working as it closes in. As if to confirm how crucial timing is to documentaries, the artist gives the filmmaker a last performance that helps make her portrait of him as extraordinary as the man it portrays. No doubt, it suited his monumental self-regard to have the last word rather than leaving it to bone-pickers and biographers.